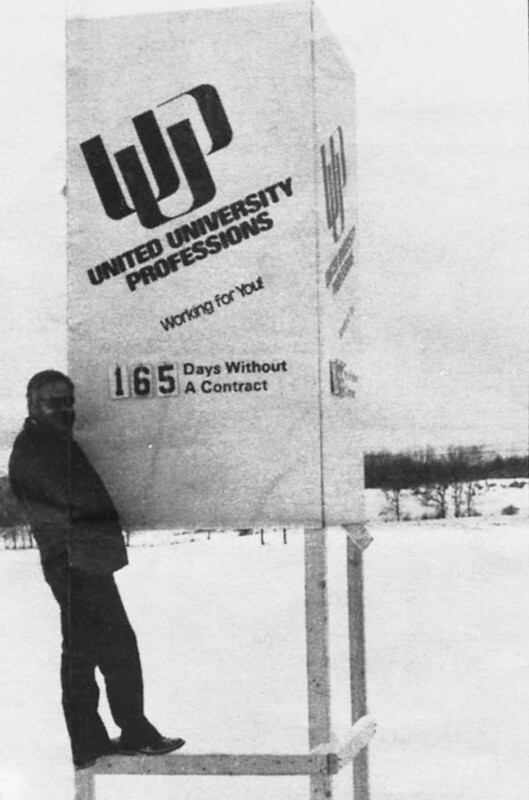 A year by year look at some of the important milestones in the history of UUP. Taylor Law (Public Employees Fair Employment Act) passes. Public employees have the right to bargain collectively to establish their terms and conditions of employment. State University Federation of Teachers (SUFT) files a petition seeking collective bargaining rights at five State University of New York (SUNY) campuses. In the spring, the Senate Professional Association (SPA) is formed. By fall, the Public Employment Relations Board (PERB) orders a SUNY-wide, single-unit election. SUFT, the American Association of University Professors (AAUP), the Civil Service Employees Association (CSEA), SPA and �no agent� are contenders. In January, SPA, affiliated with the National Education Association (NEA), is certified by PERB as exclusive bargaining agent. In August, SPA and the state sign a three-year contract. Membership reaches 2,000. 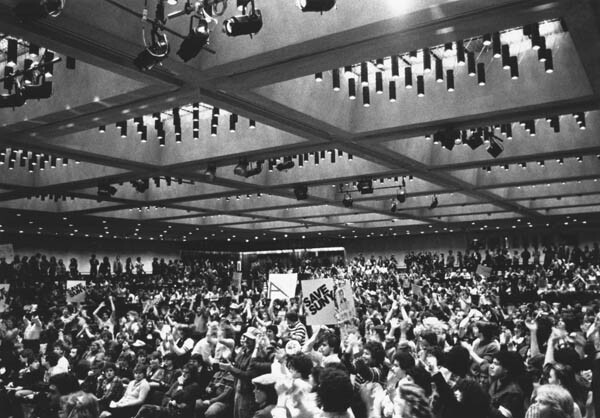 United Teachers of New York (UTNY), affiliated with the American Federation of Teachers (AFT), and the New York State Teachers Association (NYSTA), affiliated with NEA, merge, forming New York State United Teachers (NYSUT). 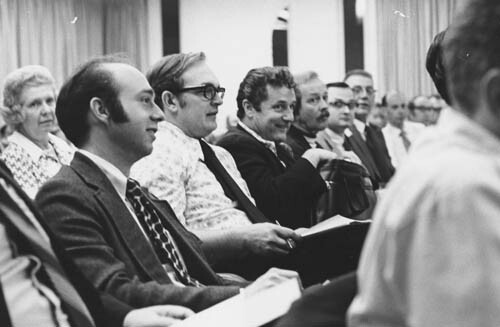 Representatives of SPA and SUFT meet to discuss a merger, leading to the formation of SUNY/United, later renamed United University Professions (UUP). UUP is affiliated with NYSUT, AFT and NEA. UUP wins battle for job security and tuition waivers, and delegates elect Lawrence DeLucia of SUNY Oswego as president. UUP tackles women�s issues and the policy of refusing women the right to work once they became pregnant. New policies are implemented that allow pregnant women to work as long as they are physically able and allow women to use sick and vacation time to offset any leave without pay. CSEA petitions PERB for the professional portion of the bargaining unit. PERB rejects the bid to split the unit and reaffirms its composition as originally established. In June, UUP and the state sign a two-year contract that includes permanent status for professionals, five days family sick leave, and across-the-board salary hikes each year of 4� percent and 1� percent in merit money. Membership reaches 4,000. Samuel Wakshull of Buffalo State is elected president. The union stages its first informational picket at the state Capitol to protest proposed budget cuts to SUNY. UUP members vote to end affiliation with NEA. UUP and the state sign a two-year contract that includes five days of family sick leave and sabbatical leave. The �agency fee� law signed by Gov. Carey directs that non-members must pay a fee equivalent to dues to the union that represents them in collective bargaining. UUP successfully overturns the Board of Trustees policy that bars women from the right to work once they become pregnant. Membership grows to 4,400. In August, the New York Educators Association (NYEA) petitions for bargaining rights. UUP wins PERB-ordered election and is certified as exclusive bargaining agent. UUP negotiates guaranteed minimum salaries for full-time employees and a benefits package for part-timers. UUP wins the removal of professional �quotas� for SUNY librarians, paving the way for promotions for librarians on the same basis as other academics. A similar victory is won for SUNY professionals. UUP wins contractual guarantees to curb unilateral decision-making by college presidents. Membership soars to 8,000. UUP members ratify a contract with salary increases totaling 8 percent, plus an extra 1 percent in discretionary funds; for the first time, the agreement includes guaranteed increases for members paid on an hourly, weekly, bi-weekly or monthly basis. Bargaining unit members receive $5,000 in term life insurance, provided by UUP. The union successfully staves off a state Division of the Budget plan to �lop off� $1 million in salaries using a skewed �faculty rank distribution formula� that claimed there were too many senior-level faculty. �Save SUNY� campaign mobilizes thousands in a call for more SUNY funding. Membership reaches an all-time high of 11,500. Nuala McGann Drescher of Buffalo State is elected president. Membership climbs to 12,100. UUP and the state sign a three-year contract that includes a statewide employee assistance program (EAP), $2 million to fund salary disparities, and a new Professional Development and Quality of Work Life grant program to address day care, workshop attendance, professional development, and study leaves for librarians. UUP musters it forces to bring more than 1,000 unionists and students to Albany to protest Gov. Mario Cuomo�s Executive Budget proposal to lay off 3,000 SUNY academics and professionals; UUP�s advocacy leads to the Legislature�s addition of $15.9 million to the governor�s budget, eliminating the need for layoffs. Sen. Kenneth LaValle and Assemblyman Mark Alan Siegel receive the union�s first Friend of SUNY Awards. UUP opens its Member Benefits Department as part of the union�s drive to enhance services it provides to members. Membership tops 13,000. UUP�s growing legislative influence helps to restore millions to the SUNY budget. Arthur Young and Co. begins a promotion and classification study of professionals in SUNY; the $100,000 study was funded through the collective bargaining agreement. 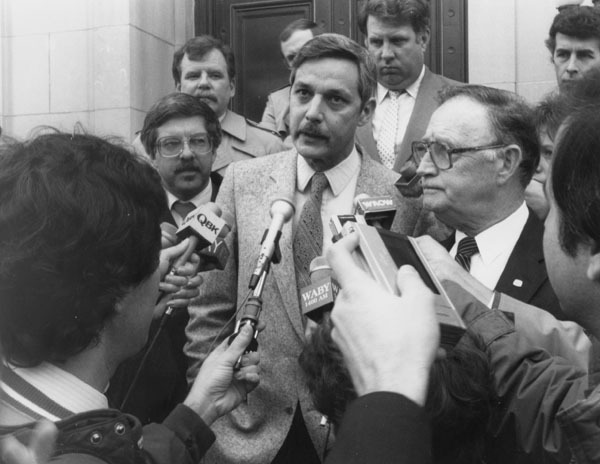 UUP ratifies the 1985-1988 collective bargaining agreement that includes a 15 percent pay raise over the life of the contract, an additional 1 percent in discretionary salary increases, and protection for long-term part-time employees through a new term appointment program. The union wins its age discrimination case that puts and end to the forced retirement of tenured faculty at age 70. Membership reaches 14,500. John M. Reilly of SUNY Albany is elected president. UUP joins an AFL-CIO lawsuit to stop health insurance rate increases. The Joint Labor/Management Committee on Fair Labor Standards negotiates the first on-call rate for members required to return to work. Membership climbs to 16,000. UUP secures $3 million to fund salary disparities. Three SUNY undergraduates receive the union�s first Eugene P. Link College Scholarship Trust Fund scholarships. UUP�s Task Force on Undergraduate Education issues its report in response to criticisms contained in the Carnegie Report on Undergraduate Education. By more than 8-1, UUP members ratify a three-year contract that includes a base salary hike of 16.3 percent over the duration of the contract; the pact also features $1 million in Excellence Awards, jointly administered by UUP and the state. 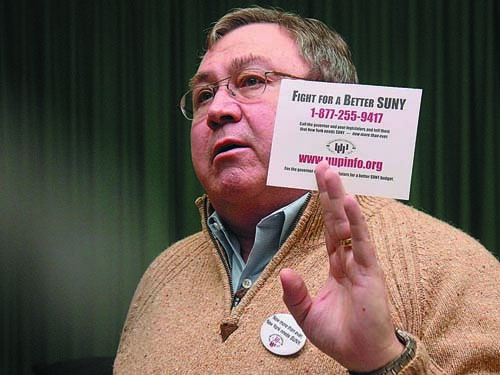 UUP opposes SUNY�s attempt to impose parking fees on campuses. UUP hosts a 90-minute teleconference to underscore the union�s vision with its report, �SUNY�s Future: Expanding the Mission, Fulfilling the Promise.� UUP reaches out to Cesar Chavez, president of the United Farms Workers, as his union begins a 36-day protest fast to spotlight the plight of farm workers. 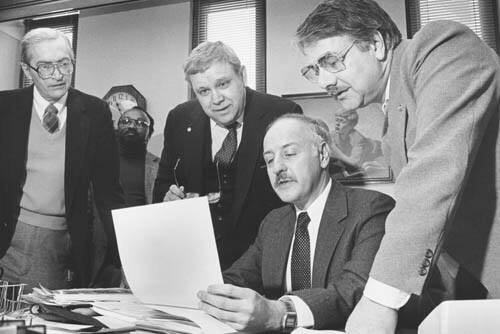 The union names its first recipients of the Nina Mitchell Award for Distinguished Service: Harold Cannon, Albany; Samuel Wakshull, Buffalo State; and Morris Budin, Binghamton. UUP completes a three-year-long oral history project, comprised of more than 40 interviews detailing the story of UUP�s founding and growth. Membership hits 21,000. The state�s four largest public employee unions (CSEA, PEF, Council 82 of AFSCME, and UUP) join forces to protest an Executive Budget proposal that threatened to cut thousands of workers from the state payroll. William Scheuerman of SUNY Oswego is elected president. UUP names 1993 �The Year of the Ag and Tech� and promotes SUNY�s two-year, state-operated colleges to lawmakers and the public. 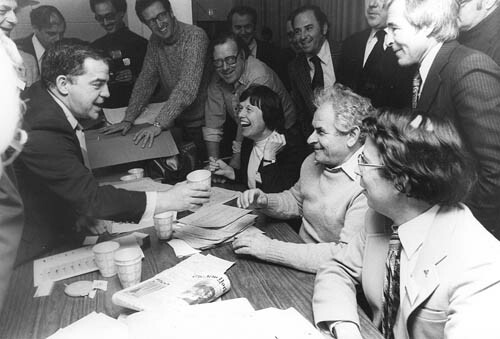 UUP establishes a legislative intern program named after former UUP President John M. Reilly, which introduces SUNY students to the mission of UUP while providing staff help during the legislative session; the first intern is Mary Jo DeBernardo, a graduate students at SUNY Albany�s Rockefeller College of Public Administration and Policy. Delegates vote to shift the status of the union�s two statewide vice presidents from full time to part time. UUPers demonstrate outside Central Administration in response to the SUNY Board of Trustees� �Rethinking SUNY� plan. 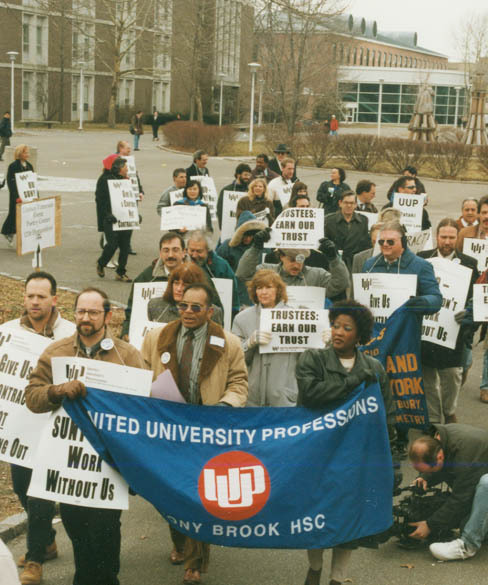 An unprecedented week of demonstrations on campuses across the state in February shines alight on stalled contract talks, proposed budget cuts to SUNY, and the suspension of the UUP Benefit Trust Fund. �Operation Safeguard SUNY� focuses attention on SUNY�s impact on the communities in which campuses exist. UUP and NYSUT support the Sweatshop Free Campaign, which opposes the sale of any sweatshop-produced merchandise to any institution of public education. 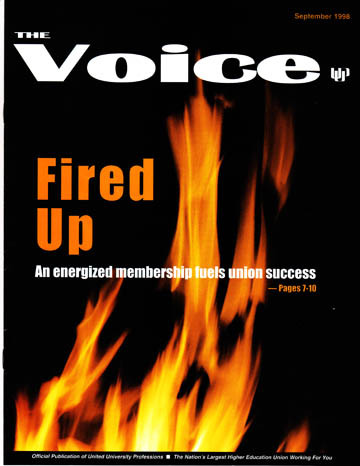 UUP�s membership publication, The Voice, evolves from a 12-page, two-color tabloid to a 16-page, four-color magazine. In their unprecedented vote of �no confidence� in the SUNY Board of Trustees, the union and Faculty Senate charge trustees with failing to advocate for strong financial support for SUNY and with disregarding long-established shared governance practices. UUP and the state begin contract talks; statewide VP for Professionals Thomas Matthews is the union�s chief negotiator. UUP wins year-round health insurance for SUNY�s 5,300 part-time employees, a major victory in wake of national attacks on public employee benefits. UUP calls on state lawmakers to scrutinize SUNY�s proposed land lease deals with private and not-for-profit corporations. Delegates vote to return the union�s two statewide vice presidents to full-time status. Delegates vote 190-90 during the Fall Delegate Assembly to remove term limits for statewide officers. UUPers take an active role in Campus Equity Week, designed to strengthen the role of part-time and contingent employees on campuses nationwide. The union community mobilizes in response to the terrorist attacks of 9/11, with hundreds of UUPers lending their expertise at Ground Zero. The number of statewide UUP Executive Board seats increases from 11 to 13, while the elected statewide chair of the Committee on Active Retired Membership (COARM) becomes a nonvoting board member. New Yorkers give SUNY high marks and are confident its graduates are well prepared for the workforce, according to a survey commissioned by UUP. The union unveils an advertising campaign called, �If you think education is expensive, try ignorance.� In March, UUP begins handing out �SUNY bucks,� symbolizing the dollars generated by SUNY in local communities. A May 3 March for Public Education draws 40,000 unionists to Albany to stress that public education must remain a top funding priority. UUP members ratify contract in record number (96.6 percent); the new four-year pact includes a 15.6 percent pay increase over the life of the contract. UUP thwarts yet another attempt to privatize the University�s teaching hospitals. UUP files a suit in New York State Supreme Court against Express Scripts Inc., the company that manages the state-run prescription drug program, charging breach of fiduciary duty and deceptive practices. 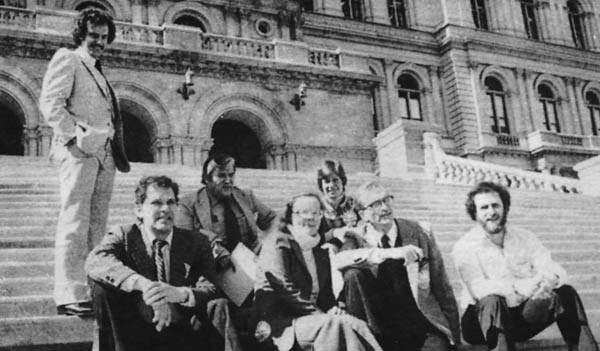 The union unveils the Disability Rights and Concerns Committee report �Disability Access at SUNY Campuses: Ten Years after the ADA.� UUP mourns the death of former UUP president John �Tim� Reilly. Five days after a major UUP rally at the state Capitol, the Senate followed the lead of the Assembly and overrode Gov. George Pataki�s vetoes of $60 million in funding for SUNY. UUP unveils its new logo, approved by UUP focus groups. A new Member Services Trust Fund is created to offer members a broad range of discounts and services. The Legislative Lecture Series kicks off with SUNY Buffalo professor Barry Boyer discussing environmental issues. �Good to Great� is theme of UUP�s award-winning TV and print advertising blitz. After months of non-stop political action�from officers testifying before lawmakers, to members protesting around the state, to unleashing a �viral Internet campaign,� to a lawsuit filed in state Supreme Court�the union successfully thwarts the Berger Commission�s recommendation to privatize SUNY�s teaching hospitals. UUP influences lawmakers to sign Optional Retirement Program (ORP) legislation that would eliminate the employee�s pension contribution to the program, provided s/he has at least 10 years of state service. UUP helps to develop SUNY�s new Office of Diversity and Educational Equity. UUP�s Globalization and Corporatization Committee presents its report on the changing structure of university education and its implications for union activity. President Bill Scheuerman steps down to take over the reigns of the National Labor College in Silver Spring, Md., and VP for Academics Fred Floss is named acting president. Phillip H. Smith of Upstate Medical University is elected president. Members ratify a new four-year contract with the state in a record-setting 97.5 percent�10,297 in favor to 249 opposed�that includes a salary increase of 13 percent over the life of the contract. UUP influences lawmakers to pass a bill making the agency shop fee permanent for public employees under the Taylor Law. Membership tops 35,000. UUP and students join forces to stress that SUNY is the $olution�and successfully stave off draconian cuts to the University. Results of a two-year, union-sponsored Gender Equity Study of SUNY academics and professionals show that there is �unexplained inequality� in academic ranks (women earn nearly $4,400 less) and among professionals in grade five or higher (women earn 20 percent less than males with comparable years of service). �Cuts to SUNY Threaten Our Future� is theme of UUP�s award-winning TV and print advertising blitz. An ambassador, corporate CEO, network weatherman and Pulitzer Prize winner are urged by UUP to share their success stories as SUNY alum. Dozens of UUPers swarm to the nation�s capital to participate in the One Nation Working Together march for jobs, justice and public education. The union unveils saveSUNY.org, a micro-website designed to educate students, citizens and lawmakers about the deep cuts to SUNY and yet another flexibility plan that would jeopardized SUNY�s mission; the micro-website called on visitors to take action by signing an online petition and faxing e-letters to the governor. 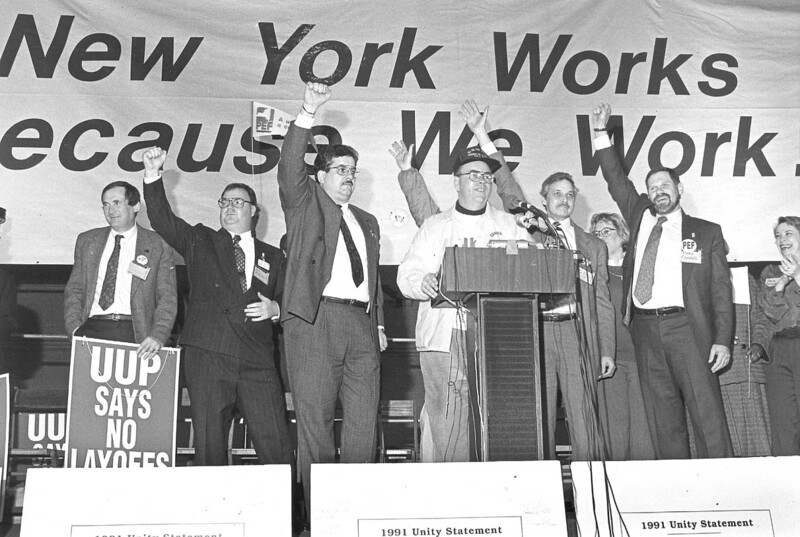 In February 2010, UUP releases the report of the Task Force on Contingent Employees that recommends ways to strengthen the position of contingent workers in SUNY and UUP. SUNY and CUNY students and unionists rally in Albany to protest deep cuts to higher education. UUP�s advocacy efforts pay off as flexibility legislation is absent in the final state budget. UUP undertakes two surveys: one to investigate pay inequity based on race and a second on technology issues. UUP and the state exchange contract proposals in August; the union is opening 25 articles and seven appendices, while the state hoped to limit the discussion to salaries, health benefits and furloughs. 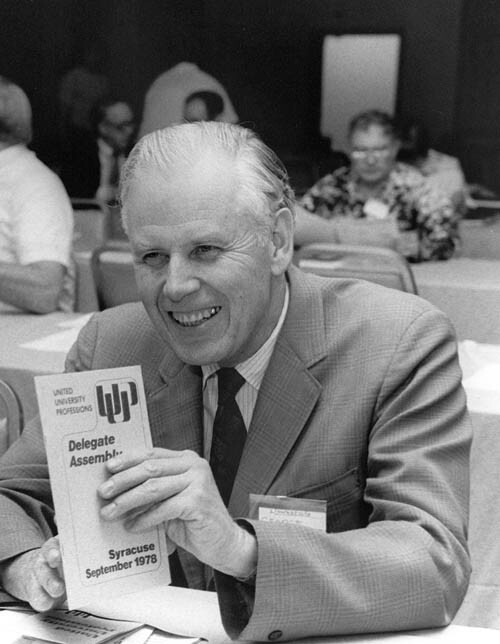 In September, UUP awards its first William E. Scheuerman Post Baccalaureate Scholarship to a SUNY graduate or professional college student. UUP takes a lead role in the Campaign for the Future of Higher Education, a coalition of education organizations across America and Canada designed to lend one voice to the higher education movement.